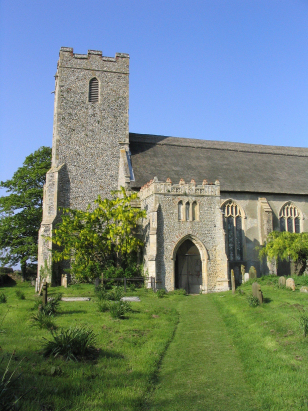 The parish of Hempstead is one of 2 in Norfolk bearing that name, this version is situated on the northeastern coast of Norfolk and incorporates the now subsumed former parish of Eccles. Hempstead is located about 1 mile from the coast and is roughly 2 miles northeast of the large village of Stalham. Hempstead is not a village as such and has no obvious village centre rather it is a straggle of cottages and farms lying on or close by the narrow winding coastal lane. Eccles is represented by the rather ramshackle and eccentric chalets of Eccles on Sea which sit where the emerging cliffs rise from the dune coast of further south. This is an area subjective to intensive coastal erosion and has a rather precarious existence. The soils here are light and rather sandy but would have provided the main economy as there is no safe harbour, other than the beach, for boats on this stretch. St Andrew's church sits on a narrow lane leading towards the coast from the above mentioned coastal lane, beyond the church this lane becomes a footpath. The church has two distinct ages represented, the chancel being the earliest and 13th century. 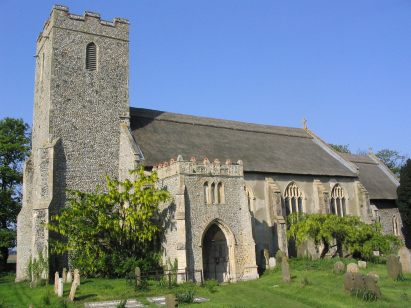 Both nave and western tower are largely in the Perpendicular style so typical of Norfolk and date from late 14th or early 15th centuries. Both nave and chancel were thatched during the restoration of the 1870s. Throughout there is much use of local flint making for a pleasant example of that tradition. St Andrew's is in a rather isolated site and is an extremely peaceful spot away from virtually all traffic noise. A single standard 800-entry register book covers the period of the transcript and continues into the 20th century. This register is filmed on Microfilm MF1622 in the collection of Norfolk Record Office which was used to prepare this transcript. This film is one of the more recent filmings and as such benefits from the good quality of images now being achieved. As a consequence this was a relatively straightforward piece to transcribe and hopefully few errors will have been made.